Trip report time! This is the final recap for my November 2016 trip. You can read all posts in the trip report here. Thanks so much for reading! 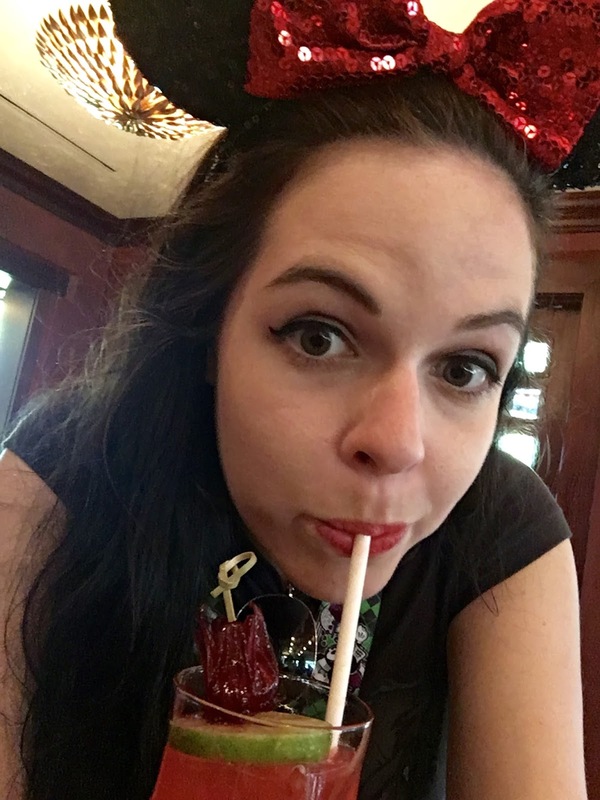 I have been dying of excitement over the fact that WDW has produced my very own drink since I first glimpsed it on a menu back in June. Naturally it only made sense to hightail it over to the Nomad Lounge to try it during my time at Disney's Animal Kingdom! 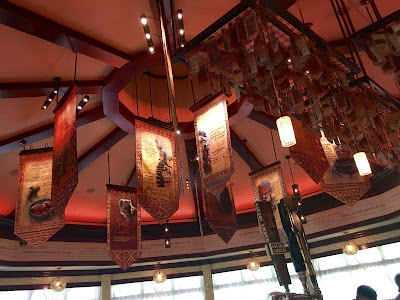 The Nomad Lounge is fairly out of the way right now, with an entrance beyond the main Tiffin's entryway, tucked back by where the Avatarland (ugh) entrance will be soon-ish. Currently there's not much foot traffic, though, and it remains a lovely, quiet respite from the standard park bustle. We'll see how long that lasts once Pandora opens. I arrived at the lounge a little before noon and no trouble securing a seat. 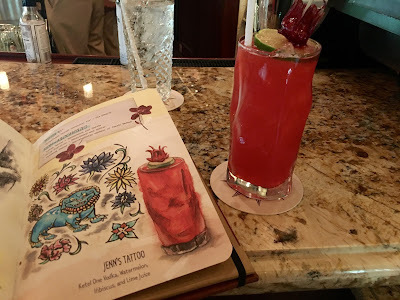 I immediately asked the bartender for a Jenn's Tattoo, but she wouldn't confirm until I answered a question: did I like sweet drinks? The truthful response to this would be "it depends," but in this particular instance I was getting a Jenn's Tattoo come hell or high water so I just said yes. While I waited, I scanned the room. 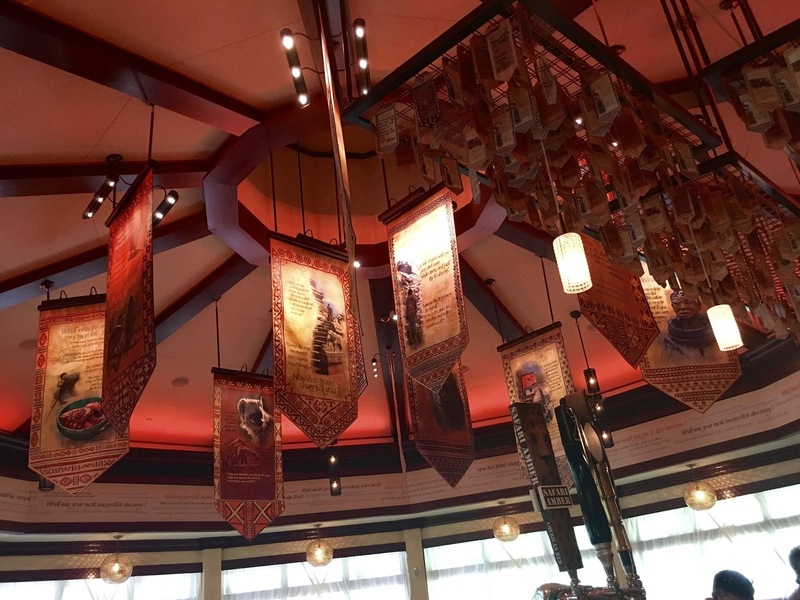 The Nomad Lounge has a distinctly exotic feel, as you might imagine, with rustic furniture and decorations that emphasize adventure. The waitstaff wears a costume more akin to an upscale country club, imparting a feel of being in, say, a rich man's hunting lodge. In addition to the bar itself, tables are scattered in the area and the patio outside. I think all those tables get waiters as I saw some interacting with guests, but I wouldn't swear to it. The bartender was training a new CM and service took a little longer than normal, but I wasn't in a hurry. Eventually a Jenn's Tattoo appeared in front of me, just as pretty as in the menu picture. 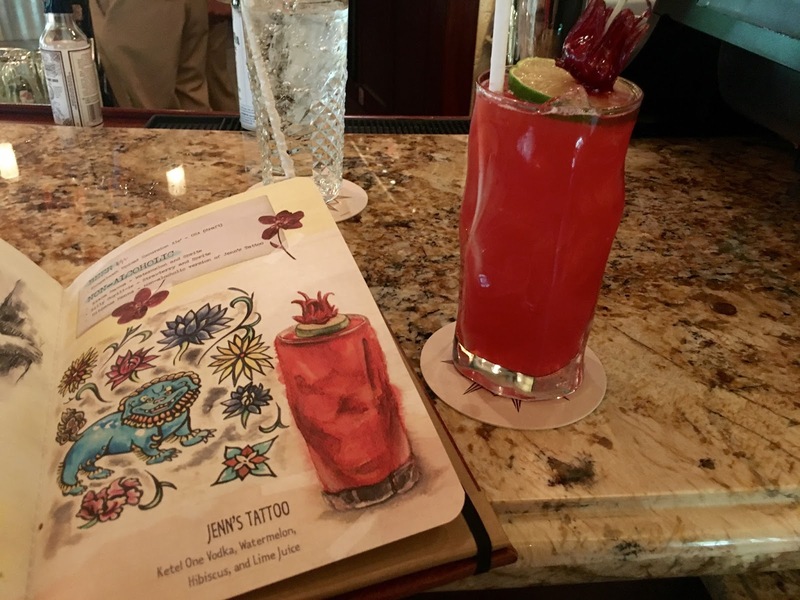 In case you can't enlarge the picture, a Jenn's Tattoo contains vodka, watermelon, hibiscus, and lime juice. It was good, but indeed very sweet. I had no trouble finishing it, but it's skirting dangerously close to the cloying zone. Ideas for hacks: more lime or cut with club soda. 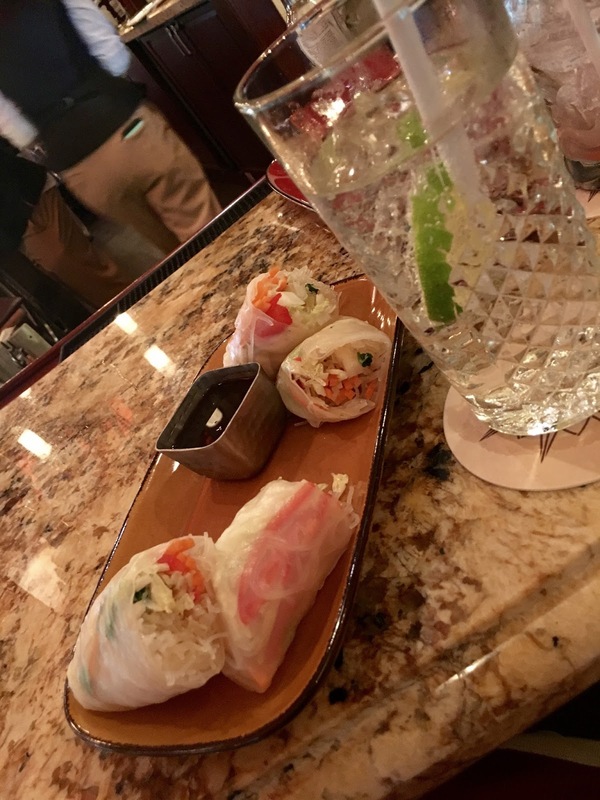 I also ordered some summer rolls, basically veggies wrapped in rice noodle paper and served with a sweet soy-based sauce (hoisin?). They were also good and helpful in that "well at least I had SOME vegetables today" way, but they disintegrated easily in my hands and I don't think there's any good way to eat them with cutlery. Great if you want something like a salad but not really; otherwise I'd say skip. There were some other interesting drinks on the menu, but I knew I had the many beverages of Epcot's Food & Wine Festival ahead of me and I didn't wanted to get sloshed/dehydrated prematurely. I sucked down a club soda instead and vowed to come back for more libations in January. That about wraps it up for November's trip report. If you'd read the whole thing - thanks! I love reliving my trips, both through writing them up and reading about them later. I hope you enjoy the reading bit too! I can rationalize ANY intake of vegetables. ANY. And then I'm like, well, I had a salad for lunch, so a mac and cheese hot dog is TOTALLY JUSTIFIED.